Use TX.Direct wash in after washing or sponging clothing and equipment the original water-repellency and breathability will be restored when the article is treated with Nikwax TX.Direct - whether sprayed on or washed in. • How to use For best results remove all non-washable parts and always clean item(s) first with Nikwax Tech Wash® in a separate wash cycle. No need to dry item(s) before waterproofing. •1.Remove all detergent build up from the detergent dispenser. •2.Place maximum of 2 clean garments in washing machine. •4.Run 30°C synthetic cycle and slow spin. 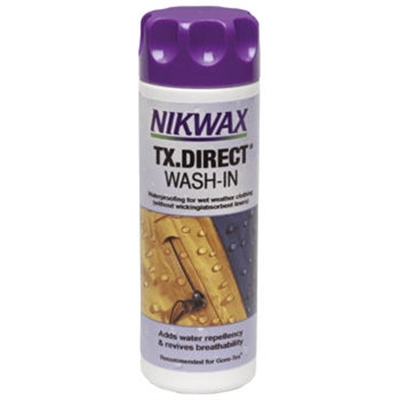 •To maintain waterproofing always wash with Nikwax Tech Wash®. Do not use detergents. Wash-In for waterproof breathable membranes, such as Gore-Tex®, Sympatex®, Entrant®, eVENT® and Ultrex®, without liners. Spray-On for breathable membranes and all laminate, PU coated fabrics with wicking or absorbent liners. Available in Wash-In or Spray-On applications.